There are sounds from my childhood that I miss dearly. Like the sound of my grandfather’s grandfather clock or the perk of his coffee maker in the morning – two sounds I could conceivably replicate today. But there are other sounds I fear I’ll never have again. The sound of summer without the ring of tinnitus! Rotary phones. 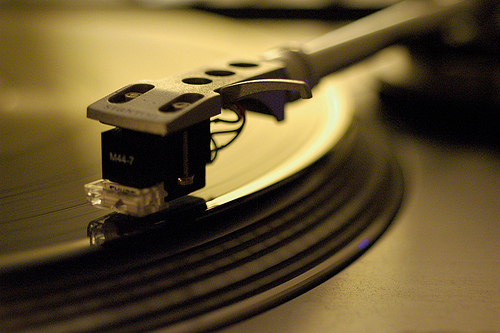 The pop and crackle of a vinyl record. The sound of a manual typewriter. Our world is changing. These sounds are unknown to most people under the age of 25 today. Arguably it’s not a bad thing. These sounds are replaced by others. The beep of a cell phone, the pure music heard from digital recordings (though i still think the warmth of sound from vinyl is unbeatable! ), the soft click of the computer keyboard… All these will change too. What will replace those? In 100 years all these sounds will predictably be completely different. In 1000 years those will be completely forgotten… and in 10000 years every bit of history we’ve ever known up to this point will be completely forgotten. Is this why we feel nostalgia? Because we also know how fleeting everything is?